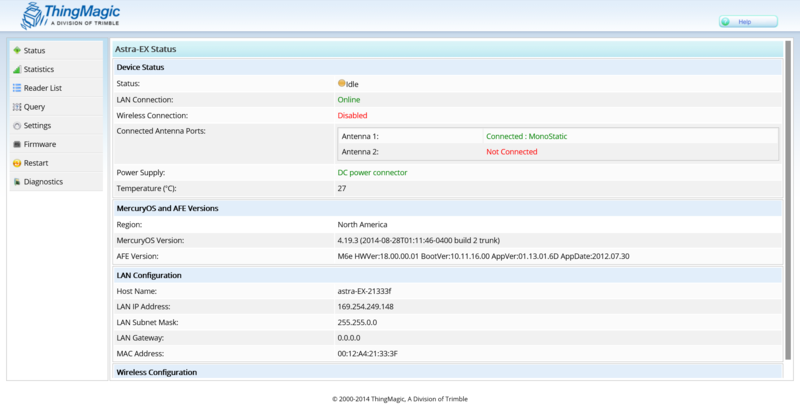 This article will explain the setup process for the ThingMagic Astra-Ex reader. To begin the initial setup of your reader, simply connect the reader to a power supply (either DC or POE) and allow it to boot up. Initial boot up could take a few minutes, and the LED next to the Power connection will change from solid amber to solid green once the boot process has been completed. Next, to connect to the reader, connect an ethernet cable from your computer to the reader's POE/LAN port. Pages 18-21 and pages 25-37 of the Astra-Ex User Guide assist with setting up the reader for various networks and connections, including a wireless connection. For a local ethernet connection, be sure to set your computer to obtain IP addresses automatically for local connections. 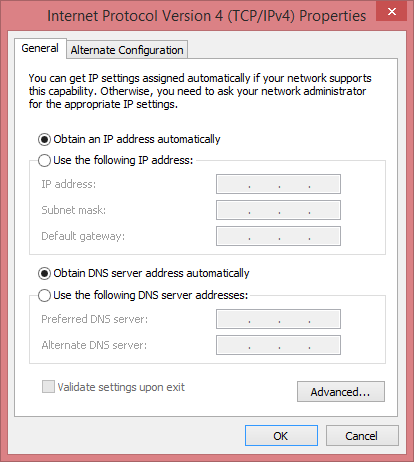 This setting can be accessed in the Network and Sharing Center on your PC. Once these networking steps have been followed, the reader should be able to communicate with your computer. 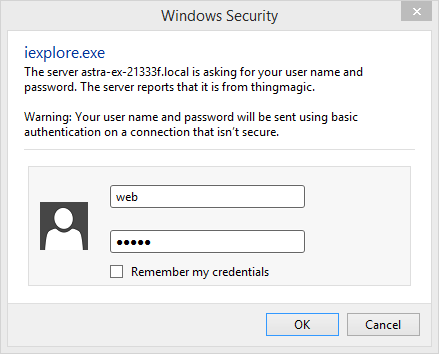 To test this connection, navigate your browser to the reader's web UI, which will follow the format of http://Astra-Ex-xxxxxx, where "xxxxxx" is the last 6 digits of the reader's MAC address. The MAC address can be found labeled on the reader next to the word LAN. For example, if the MAC address of the reader was 0012AF21333F, the hostname would be Astra-Ex-21333F (see image below). If you are using a local connection directly from your computer to the reader, add ".local" to the end of the hostname. Navigating a web browser to this address should allow access to the reader's web UI. **Note: In order to test the reader's tag read functionality from the web UI, the UI will need to be accessed from a Java-enabled browser such as Internet Explorer. Once you are logged in, you should see the Status screen for your reader. The Status screen presents the reader information to the user along with additional network information. The Settings page allows the user to configure the reader's power settings and network settings for a more custom setup. New readers may require a firmware update in order for all functionality to be available. To upgrade the firmware, simply navigate to the Firmware page and browse your computer for the latest firmware, which can be downloaded from the link at the top of this page. After the firmware is installed, you will need to restart your reader. 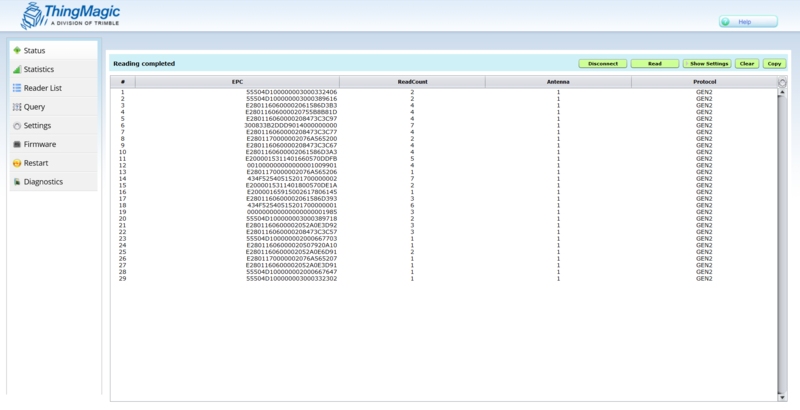 To test the reader's Read functionality, navigate to the Query page. In order for this page to load the Java applet, you may need to add the site to your computer's Exception Sites List, as explained in the linked article below. Once this is done, you may need to close your browser window, open a new window, and navigate back to the web UI in order for the change to take effect. Once the Java applet is able to run, select the "Connect" button to connect your reader, and then select the "Read" button to start reading nearby tags. The basic setup of your reader is now complete. Further functionality is detailed in the reader's User Guide, which can be found in the Downloads section at the top of this page.